While concrete foundations provide a safe and reliable means of support for various building and structure types, it does a poor job at keeping out water. The porous material of concrete absorbs water much like a sponge, which becomes problematic when water begins seeping into unwanted areas, especially problematic in below-grade applications. The entry of water in critical applications, including any basement or mechanical room within a commercial or industrial building can disrupt operations and cause thousands of dollars worth of damage. The same concern applies to residential basements or crawl spaces, especially now that homeowners are more aware of indoor air quality concerns stemming from excess moisture, rising humidity and the growth of mold. Preventing the water entry into below-grade applications is a seemingly multi-step process, requiring preventative measures during the initial construction process, along with additional measures through time as settlement and other elements begins to compromise the concrete foundation. That is where Metropolitan’s sister brand, Emecole Metro LLC comes in. Emecole Metro pioneered a more efficient and economical means that offered a permanent repair for concrete cracks, both leaking and structural, with the use of two-component epoxies and polyurethanes via the use of a low-pressure dual dispensing gun. 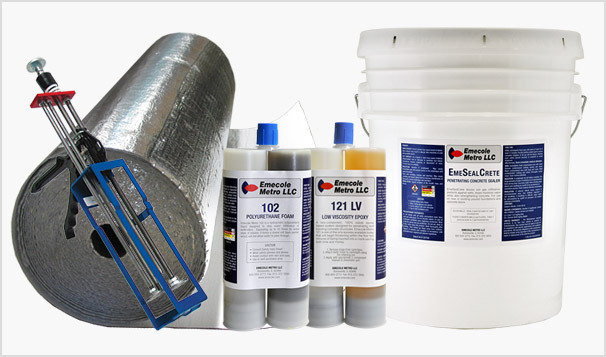 More than 30 years later, Emecole Metro has grown as a manufacturer and supplier, with an extensive line of products and solutions used to repair cracked concrete, reinforce bowed walls, and protect against the entry of water and soil gases via their line of vapor barriers, drainage systems and sealants. Their complete line of concrete repair and waterproofing solutions are relied upon by contractors and homeowners throughout North America. Emecole Metro’s premium line of concrete crack repair epoxy and polyurethane injection materials can be used for repairs in any commercial or municipal building or facility. Lingering cracks and water seepage in mechanical rooms, concrete housed systems or any other concrete or masonry structure can easily become a thing of the past! Emecole Metro’s dedicated customer service team are available to provide the necessary product selection guidance and technical support. Our existing customers may learn more by contacting their Metropolitan sales representative or by getting in touch with Emecole Metro direct. Interested in learning more about the capabilities of the Emecole Metro product line? The Emecole Metro team of concrete repair and waterproofing experts are hear to help. Give them a call at 815-372-2493 or visit their website to view their complete product lineup.